The Red Cedar Dharma Hall is a project of the Red Cedar Zen Community. 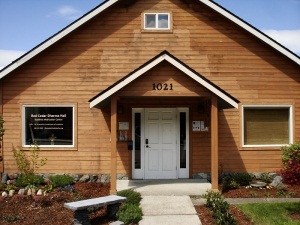 It is shared with a second Buddhist sangha (Bellingham Insight Meditation Society), and managed by Red Cedar Zen. Red Cedar Dharma Hall is available for rent by groups devoted to mindfulness and compassion. Group Membership in the Dharma Hall provides groups with regular usage times and special rates. Do you value the contribution of the Red Cedar Dharma Hall to the community and as a place of practice? Friends of Red Cedar support the Hall with a monthly or annual pledge.